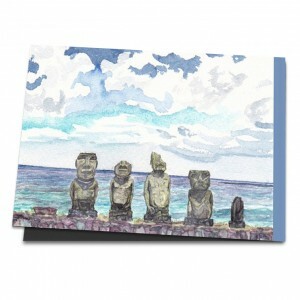 Of the many islands in the world, the one I find the most mysterious is Rapa Nui, also called Easter Island. A tiny May-green patch in the deep blue Pacific Ocean, many flying hours away from any other country. Rapa Nui is known all over the world for its Moai. No one knows why these colossal stone figures were created and what they meant. The island’s past lies in the dark. It is assumed that Rapa Nui was discovered and settled by a small group of Polynesians many centuries ago, but then remained completely isolated. Even today this island is still difficult to reach – and without my friend Lou we would never have ‘discovered’ it. “This is the most mysterious place in the world, just think of the Moai,” said Lou, her voice sounding excited. “You can read as much as you like about the colossal stone figures – but seeing them is something different! You can’t miss Easter Island if you are flying from South America to New Zealand.” And so it happened that my husband Klaus not only changed our route, but that we stayed on Rapa Nui for nine days – much longer than most other tourists. I painted, and we learned a lot during this short but intensive time. Especially about the Moai, almost all of which we visited: they’re more different than we thought. The older ones look like individuals, the younger ones like uniform tin soldiers. They are scattered all over the island, mostly in small groups and with their backs to the sea. But they remained mysterious, like the whole history of the island. Admittedly, there are clay tablets that might provide some information. But so far, no one has yet been able to decipher their inscriptions. One thing is certain: Rapa Nui was originally a fertile tropical island that once fed up to fifteen thousand people. However, when it was rediscovered on Easter Sunday 1722, it had long been a barren, infertile grass landscape and its few inhabitants were starving. How it came to be is still unknown. Year after year, many people from all over the world travel to Rapa Nui to see the Moai. But many come as well because they hope to find answers to the question of how a civilization could destroy its basis of existence. How can we learn from past mistakes? Rapa Nui has remained a grassland where wild horses graze. But in Hanga Roa, the only place where all five thousand islanders live, life pulsates. The vegetation is exotic, everyday life is colourful, the people here live more Polynesian than anywhere else in the Pacific. But if you look at the swaying sea, which stretches in all directions into the infinite expanse, or into the flickering starry sky at night, you feel above all emptiness on Rapa Nui, a thousand-year-old loneliness. Inevitably one thinks of the old legend: a catastrophe has wiped out all mankind and spared only the inhabitants of Rapa Nui. What did it mean to view yourself as the last people on Earth - on an island that can be overlooked from a hill and walked around in one day? Our landlady asked us if we would come back when we said goodbye. We did not give an answer. But every year in autumn, when summer is approaching in the southern hemisphere, I say to my husband: “I haven’t painted all the Moai yet! Aren’t we going back to Rapa Nui?” Then Klaus thinks briefly and nods in agreement. The mysteries of this unusual island are still holding us captivated. Quite obviously.